When Leaves Change Color: ($19.90, 7X10″, 230pp, ISBN: 978-1-68114-190-9; $2.99: EBook ISBN: 978-1-68114-191-6, LCCN: 2015947749, August 2015; Buy on Amazon, Barnes & Noble, or Kindle): is an adventure based on the introduction of horses to the Plains Indians. Santiago Ortega was born to a wealthy family living on a sprawling ranch in the Spanish province of New Mexico. When the Pueblo Indians revolt against the Spaniards, the lives and dreams of Santiago and his family are forever shattered. Santiago embarks on a dangerous journey back into New Mexico to find a lost brother and to seek revenge on all Indians. Ouray lives in poverty with his Indian tribe in a desert on the high plains of Wyoming. Ouray’s life unravels when hostile warriors destroy his family and capture the woman he loves. Ouray begins an impossible search to find his woman, but discovers something so unusual and wonderful that his life will never be the same. Fate eventually pulls Santiago and Ouray onto an unexpected collision course. 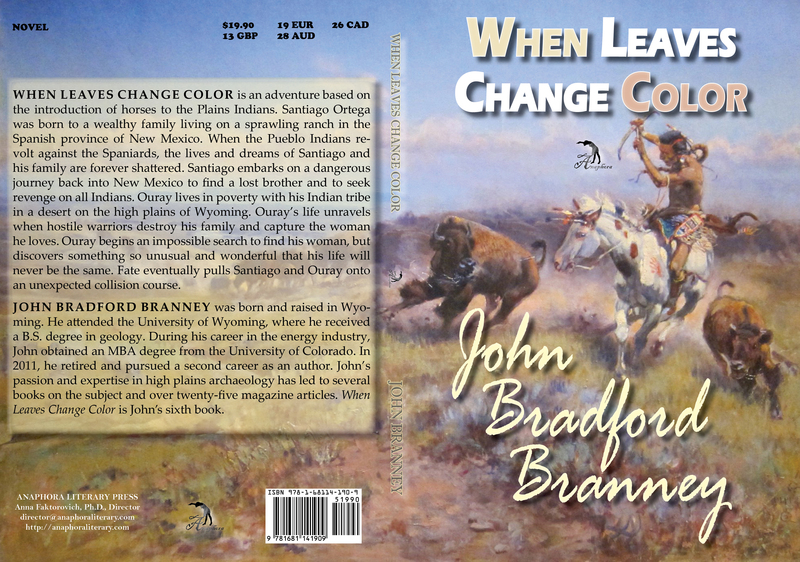 John Bradford Branney was born and raised in Wyoming. He attended the University of Wyoming, where he received a B.S. degree in geology. During his career in the energy industry, John obtained an MBA degree from the University of Colorado. In 2011, he retired and pursued a second career as an author. John’s passion and expertise in high plains archaeology has led to several books on the subject and over twenty-five magazine articles. When Leaves Change Color is John’s sixth book.